A signed, limited edition, digital print, (100 in total) taken from an original acrylic painting. Showing the view from the terrace of a charity tea room in Alnmouth, Northumberland, on a lovely sunny day. 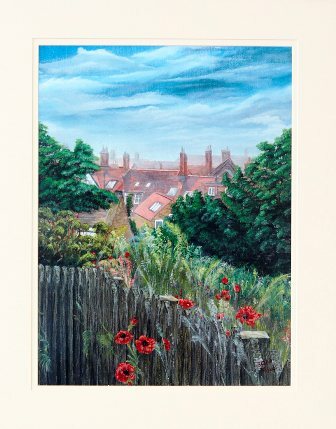 Overlooking the rooftops of the houses, the trees and the flowers as they pop their heads through the old fence.